Can I just tell you how different you look now that you’ve found someone, T-dub? It is so good to see you happy, Todd! finding someone—or in my case, being found—has certainly been the fulfillment of a lifelong dream. and hearing comments like these tickles me to death for i am truly happy—blissful actually (his word for what we’re experiencing)—inside his strong-yet-gentle arms. but the process of “finding my bliss” was not contingent upon someone else. rather, it was because i finally got right with my self, a process that officially began on August 12, 2006 (my coming out day) and then took an inspired leap forward in September 2009 at the end of a toxic relationship i’d foolishly held onto as if it were vital for my self-esteem. these two steps have brought me to where i am today—along with a healthy dose of self-introspection and the love and support of many dear friends. see: i am not happy because i have someone; i am happy because i accept myself–warts and all—which makes it even possible for me to be happy with someone. understanding this differentiation has been the crux of becoming whole and is precisely what has allowed me to find myself in what i believe is going to become a lifelong relationship. of my 5 adult relationships, only one has panned out to be “lifelong.” although it did not work in the context of a traditional social construct, it has endured only because i stepped forward in honesty, taking the dramatic and highly consequential step of loving myself first—something i had honestly never done in 38 years of life. the result of that first step was what allowed me to stop hating the part of me that was gay and accepting the true message of God’s grace and unconditional love. how could i possibly love anyone else if i didn’t first accept that?! almost immediately, positive things entered my life. to be sure, challenges did occur, mistakes were still made, i still struggled with my self, and i still caused some pain to others. i entered and then exited another relationship and only then, “alone” (though i’ve never really been alone) did i take time to focus on accepting me without someone else. i got ok with Todd. i tried my best, tried to be the best me i could be (i know, how cliché! ), struggled to right wrongs (an ongoing process), and focused on my future. i found my relationships strengthened. happiness—daresay even joy—characterized my life. a host of positive, inspiring people were drawn to me. and it sent me the love of my life. just a few years ago, i dared to believe that i was ok just as i was created–in spite of what decades of mis-religion had brainwashed me to believe. once i finally embraced that and began to do the hard work of self-love and self-improvement, my heart, mind, and spirit were ready for something wondrous. and you know what? 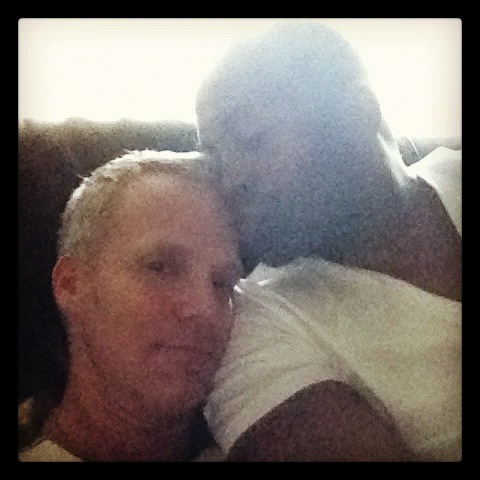 this man loves me for who i am! he knows i’m imperfect yet he’s attracted to me precisely because of who i am, imperfections and all–because, as i see it, i loved myself first. i am loved because i first loved me. if you are reading this and think for a second you’re unlovable, please listen to my story and believe that you are absolutely, 100% deserving of all the love the Universe is waiting to send you! if you think that you’ll never find someone to love you, believe that you will once you will first love and accept yourself! and if i can encourage you in any way, never, ever lose hope…always accept that you are a beautiful creation that is to be loved and embraced and that once you do, you can’t hold back the amount of love that’s going to come into your life. now. go find your bliss! Great blog post Todd! “I am loved because I first loved me,” what an awesome concept. I can’t wait until the day that I can say that I too have found my bliss. I can see how happy you are.. very exciting to see..And to travel along with you. So happy you found your bliss.